Trinity Episcopal Church has a long and rich history, having celebrated its 135th anniversary in 2010. That same church today is a warm congregation that touches the lives of hundreds of individuals and families, both within and beyond our congregation. Over the years, we have undergone many changes and we will continue to do so with faith, hope and a sense of excitement at what the future holds for us. We invite you to read about us, our community, and our common life, together with our goals and challenges for the future. Trinity Episcopal Church is a Christ-centered community on a special journey. We are a inviting and nurturing parish family that seeks energetic and spiritual ways to put faith to work in the world. 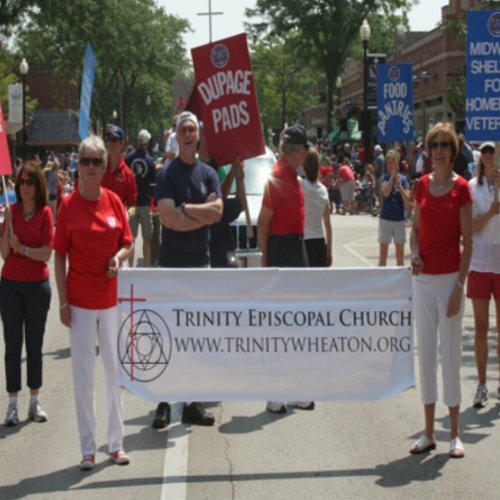 We are a community firmly placed in the Christian tradition as expressed in the Episcopal Church. At the same time, we are a community of seekers, coming from a variety of traditions and demoninations, trying to figure out what it means to follow Jesus in the world today. We gather at Trinity because it is a place where we can ask our questions and explore the meaning of faith in our lives. Trinity is a place where we can teach our children, through word and action. Trinity is a place that provides ways to share with those in need. We may look established to some, but we are a work in progress, and we hope you'll join us on the journey. At Trinity, we believe that flexibility in our community is an asset, not a liability, and so as we tell you who we are, we must begin by saying that we are a collection of worshippers who differ on a lot of issues. But we come together to grow, to worship in the Anglican tradition, to learn more about the God revealed in scripture, and to follow Jesus who calls us to serve those in need. We listen attentively to scripture. We share the bread and wine of communion each Sunday and often during the week. But the best way to learn about us is to come and see, to join us for worship, to take part in one of our programs, to be part of this giving community.